In the past, I have recounted my adventures en femme in sequential order, telling you what happened each day and night as it occurred. This time, I will try something different and describe a variety of vignettes in random order. I continued coming out to ham radio friends at Hamvention who I have not had an opportunity to come out to in the past. Their numbers are dwindling, but there are still a few stragglers out there in ham radio land. As in the past, the people I came out to this year were fine with it. One fellow, who I have known for over 15 years (and who had no clue who I was until I pointed to my name on my badge) said, "As long as you are happy, that's all that counts." The ham friends and acquaintances I came out to in past years are used to me. All refer to me as "Stana" and they all use the proper pronouns (she, her). One fellow slips up occasionally, but he is getting better all the time. Two ham friends, who I have known for over 25 years are super-supportive. Whenever they see me, they are very enthusiastic and often complimentary. At our banquet Friday night, one of them said I looked "beautiful" and after he said that, I felt beautiful. Some newer ham friends only know me as "Stana" and they are very cool with it. And my new female ham friends consider me part of their club and I am very cool with that. More than one reader has remarked that they are surprised how well I have been accepted in the ham radio community, which tends to be more conservative rather than liberal. In addition, Dayton is about an hour from the Kentucky state line and as a result, Hamvention attracts a lot of attendees from the South, which also tends to be more conservative. So I had two strikes against me coming out to the Dayton crowd. My first time at Hamvention 24/7 en femme in 2010, I felt a little uncomfortable going in, but my comfort level increased as I realized there was nothing to fear. Now, I don't think about the fact I am en femme when I attend Hamvention because I am no longer en femme. My comfort level is such that I am complete as a person when I am en femme --- so complete that I am no longer en femme, rather I am a woman. I love checking in and out of hotels as a woman. I love driving my car and pumping gas as a woman. I love dining and socializing with friends as a woman. I love doing everything as a woman because being a woman is my nature. Students femulating on stage at Indiana’s Tr-State College, 1911. You look great. I love the dress and the shoes. You should not be surprised or even find need to make reference to any biases that you may have against conservative thinking people. As a rule those of a conservative libertarian bend tend to not be critical of others. They merely want to not be harassed by government. They do not want to tell you or me how to live our lives and ask that government and others stay out of telling them how to live their lives. I like to take a live and let live approach to things and it often surprises me when people let their biases and lack of tolerance for libertarians or conservatives show. Hi Pat. I think the religious conservatives are much more troublesome for our community than the political conservatives. Stana, I think you may underestimate the effect of knowing some of these people beforehand. Some fairly conservative people, who might be more questioning of those who do not fit the standard molds, can be more accepting if they discover someone they know and like is not exactly what they expected. If they expected a man-in-a-dress, and you, their friend, come in looking and behaving as a woman, and it is obviously natural to you, some of them may be more accepting of you than, oh, say, me, who they do not know. And in a way, you provide a service - maybe the next woman like you they meet, they may think "You know, Stana is OK. Maybe this person is too?" They may try to see a person before a label. I agree with you completely, Fiona. The people who knew me forever as a boy have accepted me as a girl without a bump in the road. 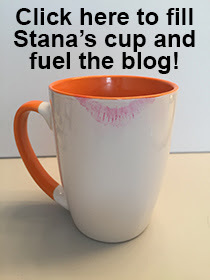 Good for you, Stana! You have clearly arrived and you did it as a good and stand-up woman! I've obtained my place as a woman since I was a teen. I've always thought I was merely gay but most men now-a-days accept me as a full-fledged woman. I'm sure it's because, as Fiona said, they 'may try to see a person before a label', but I'm OK no matter! I simply think of myself as a woman and most men see me as one. ps: I'm making headway on my morals, haha! While I certainly don't have your beauty to work with,I find that over all people are more accepting when you just comfortably engage with then as if there is really nothing different between you. I know I'm a woman and I guess it shows through. Thank you for the kind words, Shelle. I've enjoyed reading your Dayton updates, Stana. Stana , that is a beautiful dress your wearing, you look great! It's made of silk, too! I continually surprise myself when I buy a dress and after the fact, realize that it is a style that my mother would buy and wear. I guess I am my mother's daughter!